The nursery day is lively and fun. 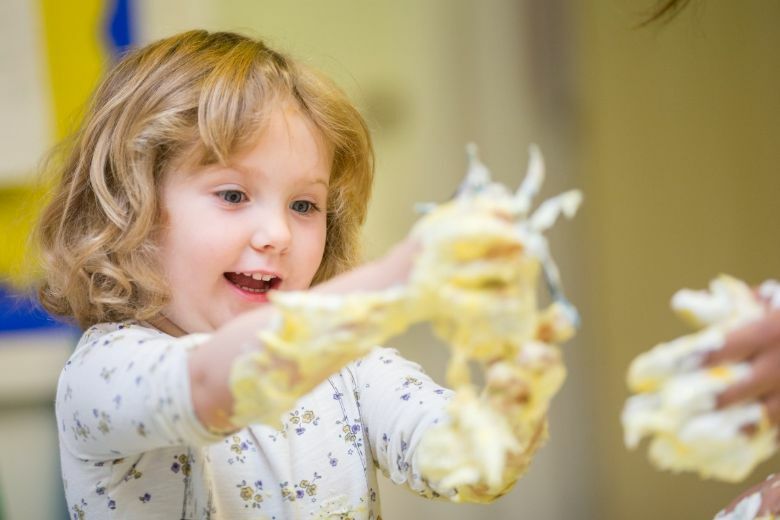 There are plenty of activities both inside and out to keep little hands busy and young minds stimulated, from sensory play with water, sand and even jelly or spaghetti, to the graphics, role play and construction areas. The nursery day runs from 7.45am to 6.00pm, 51 weeks a year to cater for the needs of working parents. Flexible morning and afternoon sessions are available. A minimum of two sessions a week is recommended for two-year olds and four sessions for over three-year olds. Outside play takes place in the morning and afternoon, whatever the weather, thanks to our covered area. PE, French, Forest School and Making Music classes are also included during the week, taught by specialists. Each session ends with a joint activity for the twos, threes and fours, such as singing or story time. Depending on what sessions they are staying for nursery children have snacks, lunch and tea included. A snack is offered morning and afternoon, with milk or water available with fruit in the morning and a plain biscuit in the afternoon. Lunch for nursery starts early at 11.30am in the dining room to give the children a bit longer, tea is also eaten in the dining room at 3.30pm. Menus change daily and a range of healthy food options are available. Menus include traditional favourites such as Shepherd’s Pie, Pasta and Curry. The Terrific Twos Room is a fun place to be a cheeky and energetic explorer! Staff encourage children to follow their natural urges to be curious and explore their world, to think for themselves and use their imagination. With lots of energy to burn children experience fun and investigative activities that have been carefully selected to stimulate minds, talk and foster understanding through playful interactions. Those children needing a sleep can go down for as long as they need. Toilet training is part of the learning process, we encourage children to become independent over time. This is the stage where children learn by doing, having fun and finding out why? Children are encouraged to play, learn and have fun whilst using all of their senses to develop their individual interests, skills and most importantly their own personalities through carefully planned activities and opportunities. opinions and understanding why things work or happen, answering all those ‘why?’ questions. The important pre-school year, the children continue to learn through play, but are encouraged to become independent in their investigations and choices as they get ready for the transition to big school. Progress is carefully observed and recorded, and next steps in learning are always strived for. A large proportion of our nursery children move up to the Reception class in Crackley Hall and they are given priority for places. The Reception classroom is sited next door to the nursery rooms, which makes for a smooth transition as they will get to know the Reception staff and environment before moving up to ‘big school’. In addition to our regular open events, we have a specific Nursery and Reception Information Evening each year for parents of children entering Nursery or Reception. .
Mrs Susan Glen-Roots looks after the Reception class at Crackley Hall, if you would like to visit or speak to her about the transition from Nursery to Reception please get in touch they would be happy to hear from you.